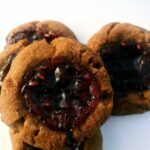 Easy thumbprint cookies are dense and chocolaty with a raspberry filling, perfect for your next tea party or sack lunch! Measure dry ingredients into small bowl. Set aside. In the bowl of a stand mixer or in a large mixing bowl with an electric mixer, blend the butter and sugar together for three minutes or until fluffy, stopping briefly midway through to scrape the sides and bottom of the bowl. Add egg white and vanilla extract. Mix for 30 seconds to combine. Add dry ingredients a third at a time, mixing until all the flour and cocoa powder has been incorporated. Be careful not to overmix, that will make the cookies tough. To Bake: Preheat oven to 350. Line a cookie sheet or jelly roll pan with parchment paper or a Silpat liner. Measure dough using a tablespoon, roll each tablespoon of dough into a ball, place on the cookie sheet. Press your thumb to make a shallow indentation into each ball of dough. 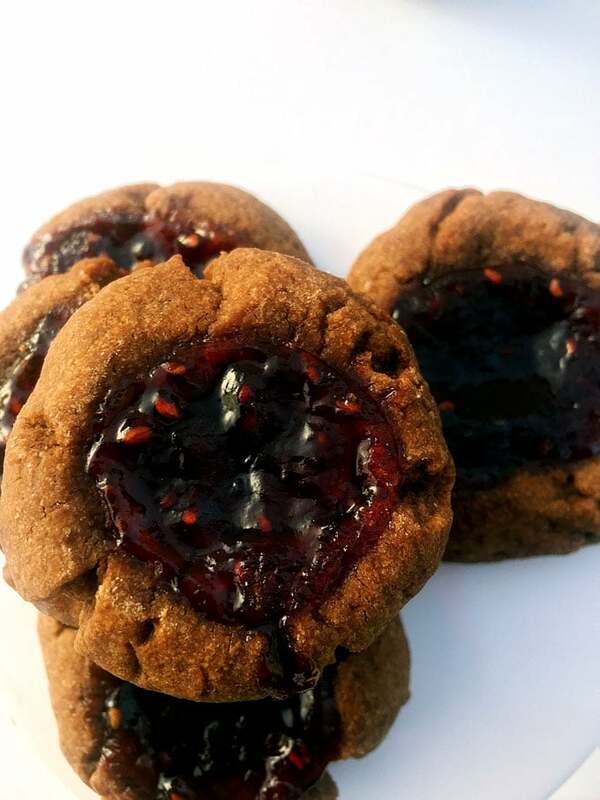 The indentation should be wider than deeper so you get a bite of jam with each bite of cookie. Place ¾ of a teaspoon of jam in each indentation. Bake at 350 for 16 to 18 minutes. My sweet spot was 17 minutes. Remove from oven and using a spatula, carefully transfer cookies to a cooling rack. Let cool for at least 10 minutes, preferably 15. Hot jam burns the skin quite well so be careful moving these cookies. Also, if you're careless, the jam can spread all over the cookie while you're moving it to the cooling rack, making a mess.